Bring your family for a true Montana wilderness experience! Joining this week-long ranch vacation in Montana, USA, will make you feel the wonder of the early explorers and mountain men as you take in the spectacular views of the Salish Mountains. Create your own postcard memories with family and friends. Join Dream Haven Guest Ranch for year-round horseback adventures, trail rides, arena lessons, and home cooked meals! During this holiday, you will be sleeping at Dream Haven Guest Ranch. This rustic Montana Ranch is for small and intimate western adventures and is catered to have up to 8 people at one time. This ranch offers Pinto room, Morgan room, and Mustang room. Pinto room is the smallest room but packs a punch. It offers beautiful views of the mountains and sleeps 2 persons comfortably. This room is equipped with 2 single beds, large closet, and shared bathroom. Morgan room is a large space with a view of the horses. This room has a king-sized bed and plenty of room for your 6-day adventure. It sleeps 2 persons and has beautiful windows to capture the morning sun. The Mustang room is the master suite. You can enjoy peace and tranquility in this private upstairs room. Facilitated with a queen-sized bed and a pull out double sofa, a private fireplace, a private bathroom, and views of the mountains, this room sleeps 4 persons comfortably. This room is perfect to be used as a family unit or a honeymoon suite. You will arrive on Sunday afternoon, settle in, then sit down to a home-cooked meal and meet new friends. This ranch vacation will take place in Montana, USA. 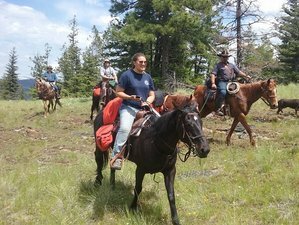 Dream Haven Guest Ranch offers private and semi-private horse getaway adventures for your perfect ranch vacation. This vacation is available all year round, with arrival on Sunday. Please select an arrival date below. During the fall and winter seasons, the rates for Mustang room are 890 USD for single occupancy, 1290 USD for triple occupancy, and 1590 USD for 2 couples. During the summer season, the rates for Mustang room are 1040 USD for single occupancy, 1440 USD for triple occupancy, and 1740 USD for 2 couples.